The commercial and marketing teams at Design Inc invest a lot of resources into Search Engine Optimisation. We have engineered it so that companies may end up on this Blog page if they have typed the words healthcare brochure design in Surrey into Google’s search bar. The question you may ask is why do we want them to do this? And the answer? 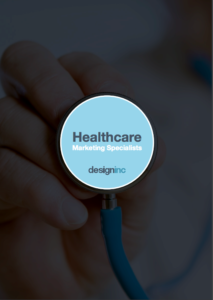 Well, that’s easy – we support many companies within healthcare, understand everything about brochure design and we do it well. Oh, and we are based in Surrey! Because of this, we want to offer our creative skills to all those searching for a quality supplier. The design & creation of brochures is a big part of Design Inc day to day work and we have an extremely talented team that can manage all aspects of the process: From strategy and themes, through to design concepts & development, copy writing, photography & translation. Moreover, we also provide brochure print solutions; litho print, digital print, book binding, finishing techniques, etc etc. Because of this, we encourage companies to find out about us and to make a relevant enquiry. One of the brochure projects we have recently delivered came from an initial enquiry that was led from this exact same keyphrase: healthcare brochure design in Surrey. In fact, that enquiry first led to us being invited to pitch for the project. Upon seeing the brief and learning more about the company behind it, we readily accepted. And fortunately, a week later, we found out that we had won the account. 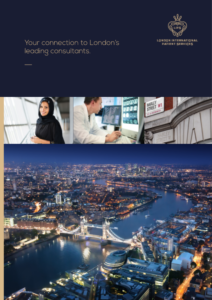 Our client, London International Patient Services are a innovative and highly-experienced group of London-based doctors who offer specialist medical treatment to affluent and influential overseas clients. The immediate project was to create a corporate, services brochure as part of their tender to pitch for the Egyptian Ministries’ accounts. This was to include the Egyptian Ministry of Health, Ministry of Defence, etc. As such, they required a brochure that appeared corporate, elegant, brand consistent and one which provided a ‘London in Egypt‘ feel. The project consisted of us providing creative, design direction, photography services, copy writing support, printing and distribution of the 20pp A4 brochure to Egypt where the client would be presenting. The aim of the project was to help compliment our clients’ presentation to the Egyptian ministries with a view to them winning the account. And, we are very pleased to announce that our client won their account. This has created a large step change in our client’s business and we look forward to seeing them grow dramatically over the next five years. We are certainly not saying this was all down to our healthcare brochure design skills. But we know it did its part. If you would like to visit our Healthcare portfolio, just click the image on the left.